The Romeoville site runs 12- to 78-in. diameter pipe on Besser machinery and larger product on a VUP station. Concrete Specialties acquired the former Northwinds Concrete operation in 1998; another asset deal involving the National Concrete Pipe plant in Franklin Park, Ill., was closed in 2014. Expanded capacity from asset acquisitions involving two peer operators, coupled with recession-rooted market rationalization, have positioned Evanston, Ill.-based Concrete Specialties Co. as a pipe and drainage structure leader serving northeastern Illinois and southern Wisconsin, from Milwaukee to Madison. From its Chicago home base, the family-owned operator covers a 75- to 150-mile market radius for concrete pipe, manhole and box culvert with plants in Elgin, Franklin Park and Romeoville, Ill., plus Kenosha, Wis. Private construction and Illinois Toll Highway Authority work this year have seen a more than doubling of concrete pipe demand over 2014 activity. 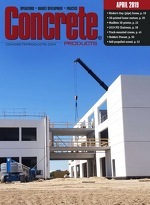 The order log prompted Concrete Specialties to add new forms and cage machinery fabrication capability to Romeoville, a site acquired in 1998 from Northwinds Concrete Products. The plant produces conventional reinforced pipe in 12-in. to 108-in. diameter; elliptical pipe in 18-in. to 96-in. round pipe equivalent; and, 5- x 3-ft. to 12- x 12-ft. box culvert. Concrete Specialties installed a Zublin MAB ASMS 150 automated pipe cage machine in 2007, providing more than adequate output at the tail of the market peak and through the recession, when demand for concrete drainage products dropped by 30 percent or more in much of the upper Midwest. When the time came for the Romeoville plant upgrade, Concrete Specialties returned to the Zublin brand, recently brought under the ownership of apilion machines + services GmbH in Kehl, Germany. The producer took delivery of the first apilion-era ASMS machine for the North American market, crews installing and commissioning the 150 model over a six-day period in May 2015. One of the bedrock automation technologies in manufactured concrete, the ASMS has afforded pipe producers accelerated reinforcing cage fabrication for 40-plus years. apilion maintains the Zublin template: Continuous and fully automatic production of round cages in a fixed (non-rotating), horizontal position, with a rotating head making spot welds at longitudinal and winding or circumferential wire connections. The machine continuously fabricates cages, with or without bell, in any length for minimum 12-in. diameter pipe. Three models are rated by maximum cage diameter, ASMS 150, 75.6 in. ; ASMS 220, 106 in. ; and, ASMS 260, 124 in. Coils staged on floor-mounted reels at the rear of the machine feed longitudinal wire of W2.5 (0.178 in.) to W10 (0.357-in.) diameter, while a reel on the face of the machine feeds winding wire of W2.5 (0.178 in.) to W18 (0.479-in.) diameter. Labor requirements are limited to one operator, who handles cage transfer and steel replenishment. Cage diameter, circumferential wire pitch and bell angle are among programmed parameters. Smaller-bore pipe cages can be output at a rate of one per minute. Concrete Specialties’ second ASMS machine is a Model 150, capable of producing cages in the 12- to 74-in. diameter range. It joins an existing ASMS 150, along with a wire roller for elliptical pipe cages and mesh bender for box culvert cages. Floor- and machine-mounted reels feed longitudinal and circumferential wires, respectively, which are secured with the rotating, spot welds. An optional automatic shear cuts cages to length. The operator removes cages as the ASMS continues at a pace in line with high output, small- to large-bore concrete pipe machinery.